While you’re out doing your last minute shopping, try this time saving Crock Pot Baked Potato idea from Skip to My Lou. How simple is this? 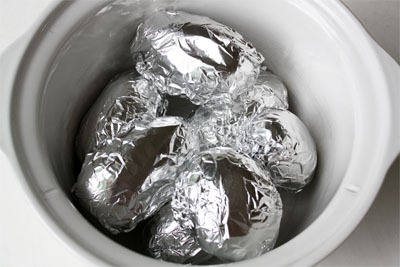 Just wrap the potatoes in aluminum foil, place in a crock-pot set on low for about 8 hours. Load them up with your favorite toppings, serve with a big salad and you have dinner. One Potato – Two Potato have fun playing musical Hot Potato! It’s a fun game for all ages to play together. Toss the tater back and forth, up high, down low, around and around! Don’t get caught holding the spud when the music stops!